Merdeka! Merdeka! Merdeka! Merdeka! Merdeka! Merdeka! Merdeka! Merdeka! And make sure you shout “merdeka” eight times only, not seven times, not nine times, but 8 times, or else you might be fined RM1000 for doing it wrongly or worse – you might be deemed unpatriotic! Tada! 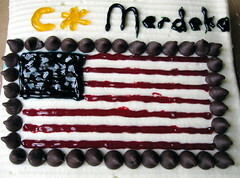 Here is my Merdeka celebration cake. Since I’m such a law abiding person, I couldn’t decorate my merdeka cake with the Jalur Gemilang, so I decorated the cake with the Bintang dan Jalur (Stars and Stripes) instead. Actually I like the name Jalur Kebintangan better. I guess the PM’s department foresaw the onslaught of similarly badly decorated flag cakes that they tried to prevent the mayhem from ever happening. I have to say the law saved me and other novice cake decorators from attempting to produce a 14-point star with the yellow icing. I think that feat is impossible. Just as I was about to eat this for lunch, I thought “Wow, this food looks pretty good. I better take a picture of it.” It looks like what I would get at the economy rice store, except that this is all home-made. I need to work on the presentation though, none of the dinnerware matches. For the past 2 days, the library was packed. Lots of students at the computers and study desks. It’s just the beginning of the semester, why is everyone studying so hard? My hypothesis is that the new kids haven’t formed their social networks yet, so in order to not look lost and alone, they bury themselves in books. Or I might be wrong, these kids could be at Lehigh to study really hard. 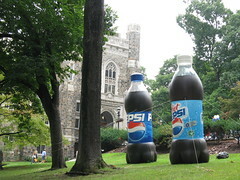 Giant pepsi bottles outside the Linderman library. 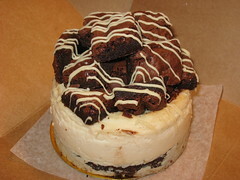 This has got to be my favorite vegan treat – brownie chunk cheesecake. Brownies and cheesecake, definitely the ultimate comfort food dessert. Much better than the chocolate strawberry shortcake or the peanut butter mousse bomb. I think I went a little overboard with this free food thing. I actually brought a plastic container with me to get the free food and took the food up to my office for lunch. Freshmen move-in reminded me of the time I moved into UPM KK6. I remember vividly the 5 minutes of “I’m so lost” feeling that overwhelmed me when my parents left the campus. When I look at the kids here, I had to smile because they too would have that 5 minutes. Self-determination has been defined as “acting as the primary causal agent in one’s life and making choices and decisions regarding one’s quality of life, free from undue external influence or interference” (Wehmeyer, 1992). Many individuals with severe disabilities have little say in basic life events. They don’t get to choose where and who they stay with or what and where they eat. A majority of them are unemployed and poor. They seldom participate in leisure activities. They have few or no friends. They are not part of any social networks. A life of no choices, no friends, no financial stability, no job satisfaction, no fun, and no quality of life. If you think about it, this is one very sad life to live. And that’s where self-determination comes in. Self-determination is a contemporary best practice in instruction of individuals with severe disabilities because it emphasizes teaching these individuals skills to be self-determined. It involves teaching choice-making, decision-making, and problem-solving skills. It involves supporting the individuals to be as independent as they can be. It involves providing supports so that they can initiate and complete a task without relying on others to do it for them. It doesn’t mean having them do everything on their own, it just means providing them the skills and supports to experience a satisfactory life. I guess an analogy would be a baby who is learning to walk. A wise parent would hold out a hand and provide just enough support so that the baby can do baby-steps across the room to where s/he wants to go. An unwise parent would carry the baby everywhere and baby does not learn to walk and does not get to go where s/he wants to go. An uncaring parent would leave the baby on the floor. An individual with severe disabilities is like a baby who will never walk on their own. So like everything else in this world, self-determination does not take place independent of the community. Unfortunately, it is easy to ignore those who are weak. Hmmmm…what have I done lately to support someone who’s weak? On the bright side, it’s orientation week at Lehigh. 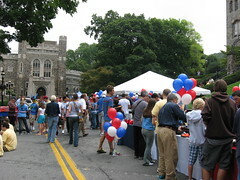 I just found out that there will be a family luncheon this Thursday for families of new students who are moving in. So I’m going to crash that luncheon and grab some free food. 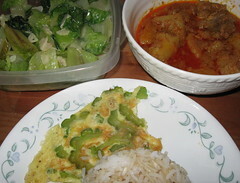 And I’m guessing the lunch will be the typical hotdogs, burgers, green salad and pasta salad fare. But it’ll be of higher quality because the university needs to convince the parents that their kids would be taken care of. 12. mooncake (if they have it, which I doubt). Best practices in instruction for students with severe disabilities are continually evolving. If you were asked to present to a school board best contemporary practices in instruction for students with severe disabilities what would you say? Present at least 5 themes, giving specific examples and supporting themes with research and the best practices literature. Inclusion is actually not a contemporary practice. For years and years, advocates for children with disabilities have been pushing for inclusion. Although the Individuals with Disabilities Education Act does not specifically say inclusion, it says that children with disabilities should be educated in the least restrictive environment (LRE). For some kids, LRE would mean the general education classroom with normal kids. And for other kids, LRE might mean spending their school day in a combination of general education and special education classrooms. And for some other kids, LRE might mean the whole day in special education classrooms. That sounds fine and dandy. Unfortunately, even in the “progressive” USA, more and more kids are not being included in general education classrooms. Many kids with disabilities spend their whole day in special education classroom with no social contact with normal kids. I’ve observed emotional support classroom for children with behavior problems, and these kids even spend their lunch-time and recess away from normal kids. This has come to a point where a group of parents in Pennsylvania has filed a class action lawsuit against the Dept of Education for violating the rights of children with disabilities to LRE. So, although inclusion is not new, it has not become a reality for many children with disabilities. Inclusion is also an idealism that I’ll have to leave behind when I return to Malaysia. Note: This is not my comprehensive answer. In my complete answer, I’ll have to cite many research articles [e.g., So & So (1998) noted that; Duh & Duh (2006) evaluated etc etc], get my facts right, and if possible cite articles that my professors wrote (for bonus points, maybe). Stay tune for Part 2: Self-determination. It seems, from the entries in this blog, my life is all about food and desserts, fussing about my car, an occasional trip somewhere, and an assortment of random stuff. I am (occasionally), but the need to study comes in waves. And the biggest tidal wave is heading my way very soon. My comprehensive exam is on September 4.
f) 2 weeks to complete the critiques and hand it in. I spent June in Malaysia, hardly looked at the questions. I spent July acclimating to Bethlehem again. For the month of August, no more fooling around. I spent the last 2 weeks trying to find the ideal studying routine (morning or afternoon or night) and the ideal place to work (linderman library or fairmart library or computer room or home). But now that the exam is almost here, the ideal environment goes out the window, I just hang out in my room and work the whole day. I guess that’s the ideal condition – an approaching deadline. I plan to get all the answers to the 6 questions done by this weekend, and then spend the next 2 weeks M-E-M-O-R-I-Z-I-N-G the answers. And on September 4, I’ll have to regurgitate out the answers. This may be the toughest exercise my brain has been subjected to since STPM, or may be not, Biochemistry exams in UPM were pretty bad.